There are those times when God speaks very plainly; as in language we can all understand so as to make sure He clearly gets across what He’s communicating without any ambiguity or misunderstanding. This is that kind of word. 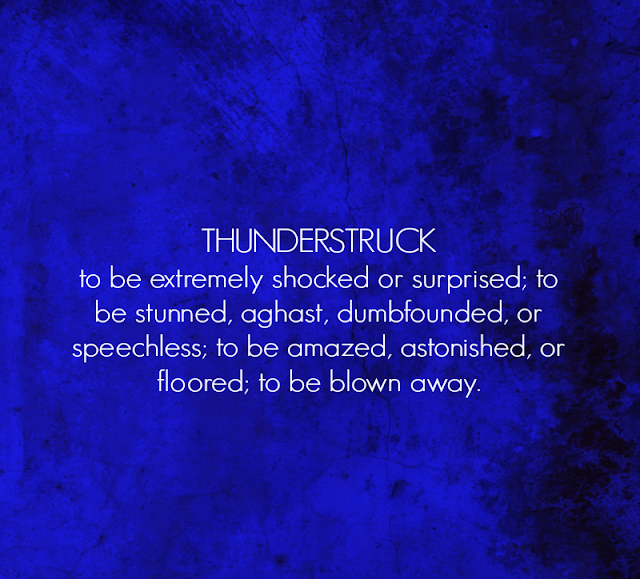 Many are familiar with the word THUNDERSTRUCK because of the song with the same title by the rock group AC/DC. And that alone will grab some people’s attention. Nevertheless, it is the meaning or definition of the word the Lord is conveying here. 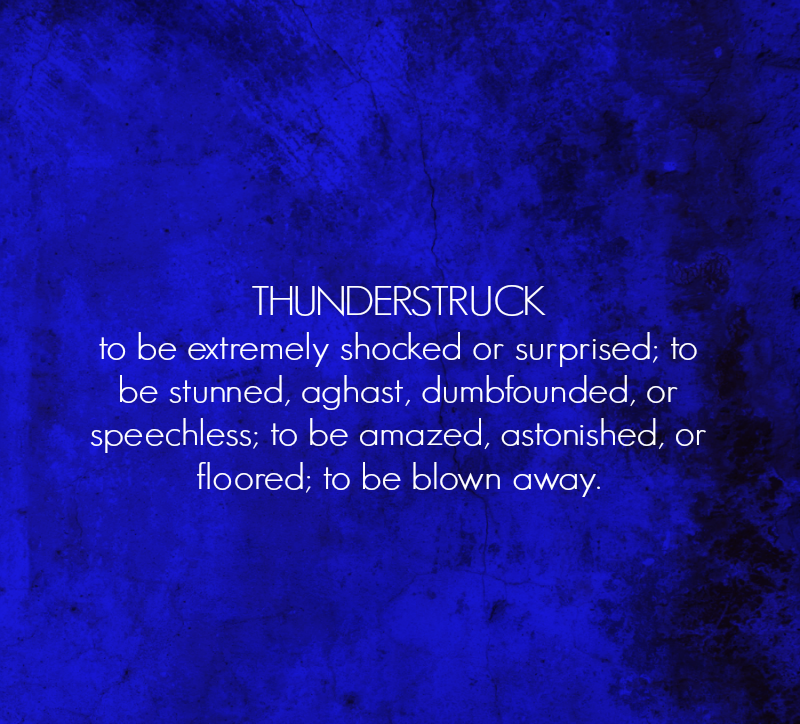 The word THUNDERSTRUCK means to be extremely shocked or surprised; to be stunned, aghast, dumbfounded, or speechless; to be amazed, astonished, or floored; to be blown away. I am hearing The Father say THUNDERSTRUCK is the word of the hour. Now, this can be good or this can be bad. I believe it’s both. There are going to be many good and extraordinary things the Father is doing in this time that will totally astound people. Answers to long-awaited prayers, His promises being fulfilled, and for many, a sudden turn-around of circumstances that have looked utterly lost, devastated, and hopeless. Also, many breakthroughs, discoveries, and miracles are going to take place. While I certainly don’t know everything He will do, there are going to be some things so good, so wonderful, it will leave many of us THUNDERSTRUCK. The time frame He is showing me about this is over the next four years, beginning in late summer or fall (September-October) of this year. So late 2015-2019. On the flip side of this is the-not-so-good. What exactly does this mean? It means many people and many situations are going to be exposed for who and what they really are. In other words, the truth is coming out. It is correct that exposure is not always bad. Good things get exposed too, and that is also a part of this time of deep exposure. However, the Father is specifically focused on exposing the ugly truth - things hidden in darkness (covered-up) that will be brought into the light (uncovered). And yes, some of it is already happening, but there’s plenty more to come. Many times, people refuse to see the truth for how it really is. And they also refuse His help to see it despite the long-suffering and lengthy pursuit of the Holy Spirit. Hence, the time comes when God has to give sight to or reveal what’s really going on. As in pull-the-curtain-back-open-the-closet-door-straight-up-truth. And it’s often shocking. So He doesn’t just expose something for the sake of exposing it. He exposes and discloses the truth in order to bring needed change. Initially, this can look pretty ugly and messy, but He will ultimately use it to usher in and establish the vital change and transformation He desires and sees is necessary. Over the last few years, which has been at His choosing and not mine, I’ve been writing and speaking out to help prepare people for this exposure (or try to help as much as possible). Regardless, there are going to be things exposed that will be so shocking; no amount of preparation could fully ready us. Some of this will be so hard to believe, it just won’t seem possible that it could be true. BUT IT IS TRUE. He is saying ahead of time; BELIEVE IT - IT IS TRUE. He will also have confirmations in place to validate it (i.e. confessors, whistle-blowers, documentation). Some of this will be so shocking, it will leave many THUNDERSTRUCK in light of what's being revealed. Some of it will be because of what He is exposing in the government of this nation – the USA (local, state, and federal). And some of it will be because of what He is exposing in His own house – the Church (particularly the leadership). This is why He’s saying THUNDERSTRUCK is the word of the hour. THUNDERSTRUCK by both the good and the bad, perhaps even simultaneously. God always informs His people ahead of time, but we don’t always listen. And the truth is, He’s been doing this for quite a long time now. Still, the Father doesn’t want us to be completely caught off guard. He cares - He cares about people; He cares about the innocent; He cares about injustice; He cares about truth. So know this is why He is doing what He is doing.